"You can’t schedule it, you can’t mandate it, and you’re not going to find it in a safe, tidy package. New Ideas About New Ideas is a roadmap to the places where innovation comes from. Read this and you’ll understand more about who has it, why you need to hire them, and how to help make the magic work." Drawing from interviews with dozens of mavericks such as contemporary artist Jeff Koons, technology oracle Nathan Myrhvold, celebrated physicist Brian Greene, and biotech visionary Henri Termeer, Shira White explores the exhilarating process of generating new ideas and bringing them successfully to fruition. Blending important concepts from the worlds of management, the arts, science, and technology, Shira White reveals profound insights into what makes today's most creative people and organizations tick. You’ll meet Corning chairman, Roger Ackerman, who led a series of extraordinary corporate transformations; genius architect Frank Gehry, who shocked the world with his earth-shattering Guggenheim Museum in Bilbao; pioneering Progressive Insurance chairman, Peter Lewis, who records his flashes of brilliance while swimming; Satjiv Chahil, who made Palm a household name; and many other innovators. New Ideas About New Ideas is bound to change the way you look at your life, your work, and your world. Introduction Sizzling Spaces: Making Innovation Happen 1. Spark Soup: Where Innovation Begins 2. Bubbling Sparks: New Approaches to Idea Development 3. Bargaining with the Future: The Valuation Struggle 4. Going Live: Bringing New Ideas to Life 5. Integrated Circuitry: Mechanisms of Innovation Action 6. Rocket Design: Innovating Organization 7. Making an Apple Pie: Beyond the Organization AppendixNotes In New Ideas About New Ideas, Shira White offers a fresh, lively, and inspiring perspective on innovation. What makes some people and organizations more creative than others? How do they channel their creative impulses into productive projects? How do they sustain their creative edge when resources are scarce? Drawing from hundreds of interviews with the world’s most creative people (from innovative leaders at companies such as Palm, Corning, AOL, and Progressive Insurance to genius architect Frank Gehry, technology oracle Nathan Myrhvold, performance artist Laurie Anderson, and biotech visionary Henri Termeer, as well as her own extensive experience as an innovation management consultant and artist, White offers many surprising insights. "New Ideas" has an inspirational quality to it, but not in a crass "lose 10 pounds in five days" way. ... No one can put innovation in a bottle, but we can keep learning about how to do it better. Ms. White's book will encourage readers to do that"
"You can’t schedule it, you can’t mandate it, and you’re not going to find it in a safe, tidy package. New Ideas About New Ideas is a roadmap to the places where innovation comes from, with some eloquent insights into how our heads create the ideas that transform businesses and lives. If you’ve ever had creative blue fire shoot from your fingertips, here’s some wherewithal you can use to get it to happen again. Never had it? Read this and you’ll understand more about who has it, why you need to hire them, and how to help make the magic work." "One word: WOW! If every businessperson read this book, the increase in our country’s productivity would be astonishing. Do it now. Innovation isn’t hard, it just takes practice." "A refreshing journey into the process of creativity and innovation—as the author rightly says, ‘the ultimate competitive advantage.’ New Ideas About New Ideas is a wonderfully insightful blend of art and business, music and management, architecture and organization. Definitely fun to read." "New Ideas about New Ideas offers a new lens through which to interpret, appreciate, and participate in the world around you. If you are searching for that elusive creative ‘edge’ where the best ideas can be generated, you can’t afford to miss this book." "There is no doubt that creativity and innovation are required to propel business forward. Shira White’s extremely insightful and very readable book describes the best of creative thinking and innovative pursuits in the world of business today. The need to understand these approaches and learn from successful practitioners is universal in any business climate." "Innovation is the biggest challenge facing Corporate America. Shira White’s new book is loaded with helpful concepts that will get your company moving in the right direction." "A refreshing journey into creativity and innovation, as the author rightly says, 'the ultimate competitive advantage.' New Ides about New Ideas is a wonderfully insightful blend of art and business, music and management, architecture and organization. Definitely fun to read." - Stan Davis, author of Lessons From the Future and BLUR. "The ‘spark’ that ignites the innovation process is not readily understood by many looking to compete in the new millennium. Shira White’s book presents diverse perspectives on the driving forces behind the most creative companies today. It provides a benchmark for those who want to look beyond their horizons for growth." "New Ideas about New Ideas does a wonderful job of blending both left brain and right brain thinking, which is so essential to creative breakthroughs. Shira White is able to bring her uniquely artistic and human touch to an area that is too often treated like scientific process, and in so doing offers a fresh perspective on innovation in a corporate environment. This is just the kind of thinking we need in these highly competitive and trying times." "New Ideas About New Ideas delivers insights about the nature of the creative process across a variety of activities illuminating the rewards of taking risks and demonstrating why and how innovation happens. For all those interested in the mysteries of the creative process, this book is essential reading." importance of asking ‘perfect’ questions to drive innovation and gives us an exciting array of intriguing answers. We all need new ideas, always. It’s a must read!" 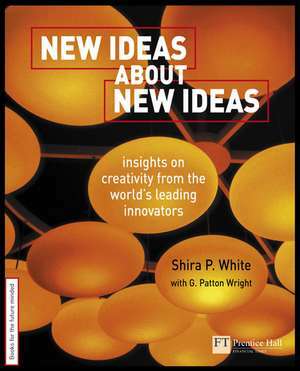 "In New Ideas about New Ideas, Shira White shares the secrets of successful innovators, providing an inspiring insight into the impact of creativity and innovation on business success. " is president of The SPWI Group, a leading Innovation Management and New Product Development Consulting Firm. Clients include a diversity of companies across a broad range of industries. Shira has deep and varied experience in creative direction, strategic planning, business development, qualitative research, trend analysis and future studies.